When a home repair deal seems too good to be true, it probably is. Unfortunately, many people claim to be contractors, plumbers or other home improvement experts without having any credentials to back it up. These individuals may come to your house or contact you in other ways offering services at prices that seem impossibly low. It may be tempting to take advantage of a great deal, especially when it comes right to your door. However, you need to be extremely cautious about contractors and home improvement specialists who may be trying to run a scam. Oftentimes, painters, roofers, plumbers and contractors will offer a low-cost inspection, followed by an assessment that you need an extremely expensive solution to fix the issue at hand. 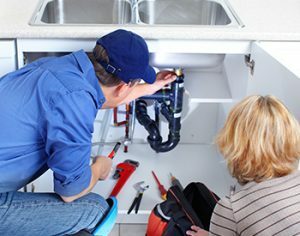 Below, learn about the most common repair schemes you can get sucked into, and find out how to avoid being the victim of a home improvement scam. Plumbers, painters, contractors and other home improvement specialists may all have different licenses and credentials, but in general, you should be aware of any “pros” who hesitate to let you verify this information. People who do not want to show you credentials may have something to hide, such as the fact that their licenses are no longer valid, or do not cover the type of work you need done. In addition to not having the correct licenses, many scammers will avoid getting permits that are required to do certain types of repairs. It should always be a red flag when someone tries to pressure you into doing work without a permit. Not using a permit means a contractor has no obligation to stick to codes and other important policies. This can cause trouble down the road if you try to sell your house with repairs or renovations that are not up to code. One of the most common repair scams is when companies tell homeowners that their technicians have just finished a job in the neighborhood, and have leftover material that they have to use, or else it will have to be thrown away. For example, driveway sealing service providers may tell a homeowner that they have just finished coating a neighbor’s driveway, and that they have leftover sealant that they can use for a reduced rate. Unfortunately, in this case, most scammers use cheap and ineffective materials that usually wash off after a rain storm. There are many other ways that contractors and other pros can try to pass off substandard parts and materials, which is why it is so important for you to verify the authenticity of anything used to repair your home. For example, if a contractor is fixing your air conditioning unit, make sure you can see the packaging and documentation for the new parts before they are installed. It is easy for disreputable repairmen to replace bad parts with “new” parts that are actually salvaged from a different system. Many scammers try to pressure you into making a snap decision, as this reduces the likelihood that you will go digging around for reviews or ask for licenses and credentials. There are many tactics for getting you to make an immediate decision, such as comparing your home to others in the neighborhood, and claiming that you can increase your property value by doing certain repairs. If you are ever pressured into making a decision on the spot, know that this is usually exactly what a scammer wants. In some cases, you will simply get substandard service when you fall for a scheme that you are pressured into taking right away. Other times, you will never see a contractor again after you have agreed on a service and made a payment. Some scammers unfortunately prey on people at times when they feel the most vulnerable. If your home was damaged in a natural disaster such as a hurricane, tornado or flood, it is important to be skeptical of any repairmen who claim you need major fixes, such as replacing your entire roof when patches or small repairs are all you need. Many illegitimate repairmen will show up unannounced in towns hit by severe weather, complete substandard work on countless homes and then disappear before anyone can complain once the repairs fail. Unfortunately, it is tempting for homeowners to take scammers up on their offers, especially if large areas have been hit hard by a storm and there are hundreds of homes that need repairs right away. Even in urgent times following a natural disaster, it is still important to check contractors’ licenses and credentials, rather than making a deal with someone who may be disreputable. Legitimate contractors will commonly ask for an appropriate down payment in order to secure a service. However, some scams involve asking you to make a disproportionality large down payment, or even pay in full for a service before it is carried out. In general, you should be wary of pros who ask for more than one-third of the repair cost as a down payment. Depending on where you live, your state may regulate the amount that contractors can receive upfront, so be sure to check if you are not comfortable with the amount a professional asks of you. When it comes to paying contractors, you should be especially wary of pros who only accept cash, as there is no record to verify that you have made a payment. And lastly, as a general rule, you usually want to avoid hiring contractors whose bids are significantly lower than the competition. If you think you are getting too good of a deal, you probably are, and it would be best to look elsewhere.